This is a blend of our unique tawny Ports aged for 7 years in our cellars after a careful selection of the best 6 barrels. 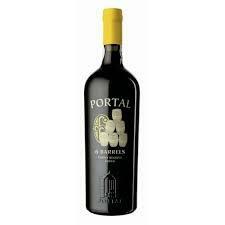 The brand is also a tribute to Quinta do Portal's founder to each one of his 6 grandchildren. Enjoy slightly chilled with egg-based desserts, fruit pies and soft cheeses. There continues to be substantial investment at Quinta do Portal: new cellars to accommodate the huge Port vats, new equipment that picks out only the ripest grapes, new gravity feed platform, softer pumps and presses all lead to sweeter, riper tannins and rounded complexity.In addition Pascal Chatonnet, from the Institut d'Oenologie in Bordeaux, has been working as a consultant with winemaker Paulo Coutinho in the areas of vinification and barrel ageing since the winery's inception and the results have been exceptional. Quinta do Portal consists of four different estates, one of which, Quinta dos Muros, has been in the family for over a century. Most of the vineyards lie at highish altitudes for the Douro, so escaping the incessant summer heat, at least by night, and producing grapes that make wines of freshness and elegance. With a stunning series of vintage ports in the last few years, and perhaps the best examples of fortified Moscatel you'll find in the Douro, it is time for wine lovers to take a trip to Portal; the latest addition to the winery is a fabulous modern guesthouse, the Casa das Pipas. "This estate, operating under the supervision of French consultant Pascal Chatonnet, is producing an array of wines that generally perform well at fair prices". Mark Squires - The Wine Advocate January 2008.